All organizations, public and private, must take steps to safe-guard assets, produce reliable financial reports, promote effective and efficient operations and ensure compliance with laws, rules and regulations. Management is charged with creating an appropriate control environment to achieve those objectives. That environment should incorporate a comprehensive system of internal controls that includes a code of conduct communicating the organizations standards for ethical behavior. The challenge facing today’s leadership is how best to develop the appropriate control environment given the diversity that exists in today’s workforce. To better understand this issue, two recent articles are examined addressing the differences in generational ethics. Studies have been performed identifying generational differences in ethical attitudes and beliefs and the effect this may have on governance. Understanding this will impact the strategies used to teach and reinforce codes of ethics to employees to ensure organizational success. In 2013, the Ethics Resource Center (ERC) analyzed data collected from the 2011 National Business Ethics Survey. These results were used in two articles, one by Curtis Verschoor (August 2013) in Strategic Finance and the other by the Institute of Business Ethics (June 2015) to examine generational differences in workplace ethics. The Institute of Business Ethics (IBE) describes the work ethic of millennials as goal oriented and entrepreneurial. They prefer a participative style of interaction. They communicate indirectly using social media and prefer using digital communications such as voice and email over direct face-to-face communications. Millennials expect immediate feedback on their performance and are not primarily motivated by monetary rewards. Instead, they seek meaning in their work and want their organizations to make a difference. They place a high value on relationships with colleagues and immediate supervision as opposed to a hierarchical organization structure. They enjoy working alongside others perceived as bright and creative like themselves. Verschoor describes millennials as having shorter attention spans and needing immediate feedback and recognition for their efforts. Millennials are technology-savvy and like using their computers, cell phones, tablets and other gadgets for accomplishing their work. They prefer working in a relaxed and informal office environment where dress codes are come as you are rather than formal or even business casual. Both articles note that millennials are not as enamored with authority as previous generations. They are more likely to question what they are told to do. This behavior is believed to explain why in the survey results they seem more likely to identify and observe misconduct in the organization. Both IBE and Verschoor describe millennials as more likely to recognize certain behaviors as unethical (lying, stealing, abuse of company resources, bribery and fraud). But the survey results also indicated they were more inclined to view other types of behavior as acceptable. For example, millennials found it more acceptable to blog or tweet about the organization, keep copies of confidential documents, accept friends in social media networks that were also clients and customers, use social networking media to learn about competitors, upload personal photos using the company network and copy software applications for use at home. The articles provide a conflicting account about the likelihood of millennials reporting misconduct. Verschoor reports that millennials are as likely as others to report misconduct while IBE interprets the results as indicating they are less likely to report it. Consistent with mMillennials willingness to use technology in the workplace, Verschoor notes the survey results indicate they are more interested in using ethics tools like hotlines when reporting misconduct. The IBE article approaches the issue from a neutral perspective by describing the differences as idiosyncrasies and the interactions between the generations as a values revolution or clash of values. IBE recommends that organizational leadership avoid a “one size fits all” approach to ethics training and communication and instead accept and embrace the generational diversity. The ethics program should focus on millennials’ desire for a more participative style and the importance they place on relationships with colleagues. Verschoor takes a more negative approach to addressing the millennials view on ethics by describing the situation as “disturbing” and indicative of a “downward shift in business ethics.” He recommends organizational leadership implement a strong ethics program to promote ethical behavior and one that provides millennials with the mechanisms they are more likely to use to report misconduct such as hotlines and rely on co-worker support to reinforce the ethical values of the organization. What does this tell us about millennials view on ethics and its effect on governance? 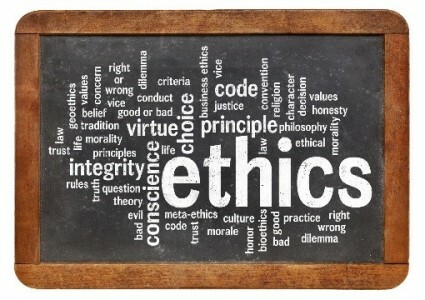 We must accept that the millennials view on ethics is different from previous generations. One might say it is more relaxed. Each generation’s view on ethics is different from the one preceding it and it could be argued that each successive generation impact on the organization is viewed as negative to some degree. The key is going to be how leadership is able to harness the strengths of the millennial generation while at the same time controlling for any weaknesses. That is the purpose of a control environment. Leadership must establish a culture that allows employees the freedom to succeed despite their differences. Very insightful article. I appreciate the perspectives and the research. As a GenXer who manages a mixed group of GenXers, Millenials, and Babyboomers, it is helpful to read and learn more about the “mils” culture. But I also recognize that there are some “mils” that share the ideals of previous gens. Technology is definitely in the forefront, and for managers, these tools are indispensable. Gone are the days where you consider the budget shortcomings over investing on tools to improve productivity. Specially now when sustainable practices and alternative work spaces are the wave of the future to increase efficiency and reduce waste. As many of our policies become outdated, developing new strategies to accommodate the new generation must also accompany new strategies for educating staff on accountability, responsibility, and ethical behavior. Thank you for the article.